Where do I even begin with this book? It is the most gut-wrenching, awful book, but at the same time it finds beauty in its own way. This book is the story of Liesel Meminger from the viewpoint of Death. On her way to her new step-parents' home, the home of Hans and Rosa Hubermann, she sees both her mother and her brother Werner for the last time. Her mother left her through force of the government, and Werner left her through the force of Death. Liesel arrives at the home of Hans and Rosa Hubermann alone, and a bit grief-stricken. When she begins school, she is moved to a class far below her age, for she can neither read nor write. She came home frustrated every day, longing to be able to decipher the words and to read them with ease. She eventually asks Papa for help. Papa, though he left school in the fourth grade, knew how to read. He wasn't the best reader, or perhaps even the most adequate teacher, but he was patient and he taught Liesel. And so began a romance between Liesel and the words. In June of 1939, a very interesting person shows up on Liesel's doorstep. Or at least, an interesting person to be seen on the streets in Nazi Germany. Max Vandenburg appeared, one of the very few free Jews left. 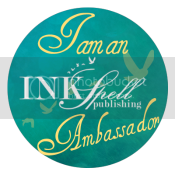 Over the course of the book, Max becomes like a brother to Liesel, and two very unlikely people come to share a beautiful story. They share words, and they share their stories. This book, I'll admit, made me cry. This is quite a rarity for me. Books always evoke my emotions, but my tears are a bit harder to come by. It shows how people lived in World War II, and while this may not be a true story, it could have been very real for some little girl in Nazi Germany. This book is so emotional, and it tells a heart-breakingly beautiful story. Most of the book is very emotionally involved, although there are some dry parts. 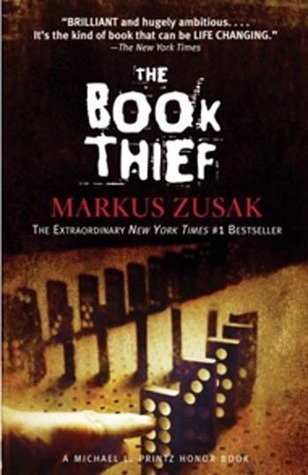 For the most part, though, Zusak did a pretty good job of keeping the story interesting. Also, this book is not by any means told in chronological order. 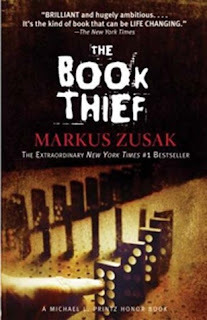 Typically, I'm not a huge fan when authors do this, but Zusak pulled it off very well in this one. He knew when to tell the certain parts of the story, and how much he needed to tell. He put the pieces of the story together in a way that made it extremely emotional. Even though it was not told with a regular timeline, the story still made sense, and the chronology was still intact enough that it did not confuse the readers. The reason I gave it four stars, however, was that there is SO MUCH vulgarity in this book. I suppose that it was written in dialect, but even so, I felt like it took away from the story. But that's my personal opinion. And, that is my only major problem with it. It was overall a great book, and it really opens your eyes to a side of WWII that maybe you hadn't thought of before.